Normally, I would talk about the journey to the Midwest Automotive Media Association Fall Rally. Well…what about the journey from it? The original plan was thrown out the window due to some personal changes in my life. With respect the people involved, I rather not comment further publicly on those changes. Yet, those changes prompted me to rearrange my original plans for the short week in the Chicago area. Therefore, I spent three nights in the Northwest Burbs with the MAMA Fall Rally and its welcoming dinner as the focal points of my stay down there. The trip began on Monday morning as my bags were put into the 2018 Toyota Camry Hybrid XLE. Getting there was quite familiar – Interstate 94 to Tomah, Wisconsin, which meets with Interstate 90. In Madison, I stayed on Interstate 90. That was regrettable, due to a very long stretch of construction that continued all the way to Beloit. Keep in mind that I left the house in Robbinsdale around 4:30 in the morning. That last fact was done for a reason – to get into Chicago with plenty of time to do things on the first day. After the usual run on the Illinois Tollway portion of Interstate 90, I made it in time for lunch. As a tourist, I could do plenty of Chicago restaurant chains, like Portillo’s, Giordano’s, and the like. But, no. I choose something completely different. 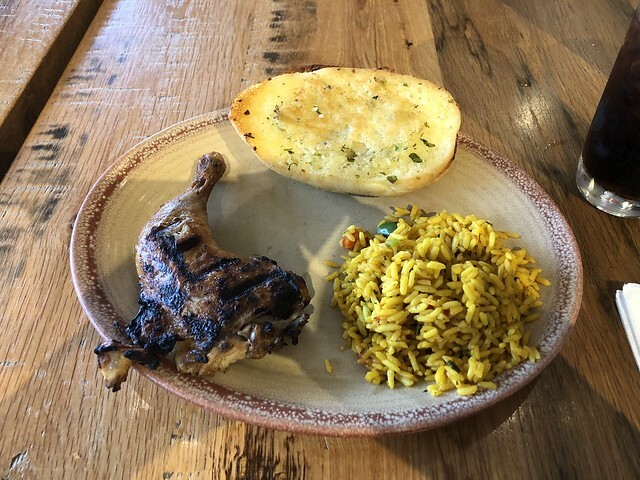 Nando’s is a South African-based chain of chicken restaurants. Their cuisine consists of a Portuguese-Mozambican style of roasted chicken called Peri-Peri. The chain has a following in far-flung places -0 not just South Africa, but in the United Kingdom, the Persian Gulf states, Malaysia, and so forth. Chicago and Washington, DC are the only two places where Nando’s have restaurants in the USA. The one I went to was at Westfield Old Orchard mall in Skokie. This upmarket mall seemed just right for Nando’s. Believe me when I say that it was worth the drive to make it for lunch. This chicken was fantastic! Probably the best I had of any chain I have eaten at – American or otherwise. My “base camp” was the Wingate by Windham hotel in Schaumburg. 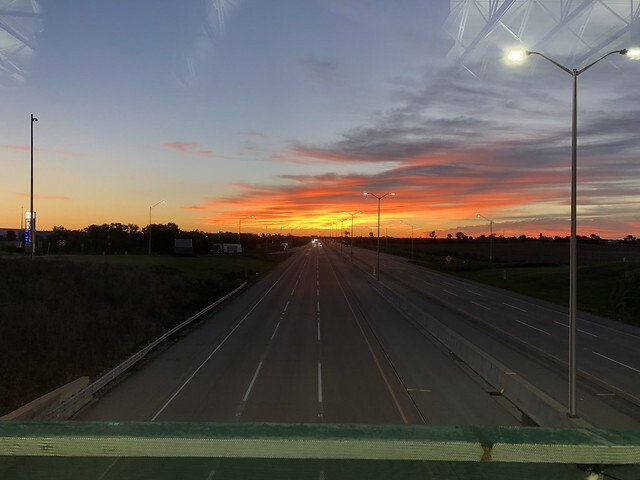 Located off of the Roselle Road exit off of Interstate 90, it provided a convenient location for activities, as well as a comfortable place to sleep. I will highly recommend this hotel for those looking to spend less on their accommodation outside of the city of Chicago. Monday was spent getting reacquainted with the Northwest Burbs and to get some work done. For dinner, I went with a friend’s/reader’s suggestion of a bar and grill down Golf Road in Schaumburg. Kuma’s Corner had a metal/hard rock theme, as reflected in its menu. It was fine…rather, just OK. I see why it is a place where you may find favor in it. Tuesday was spent with a bit of automotive tourism. In the Twin Cities, our dealerships sell many brands new, except for a few. Rolls-Royce just happens to be one of them. 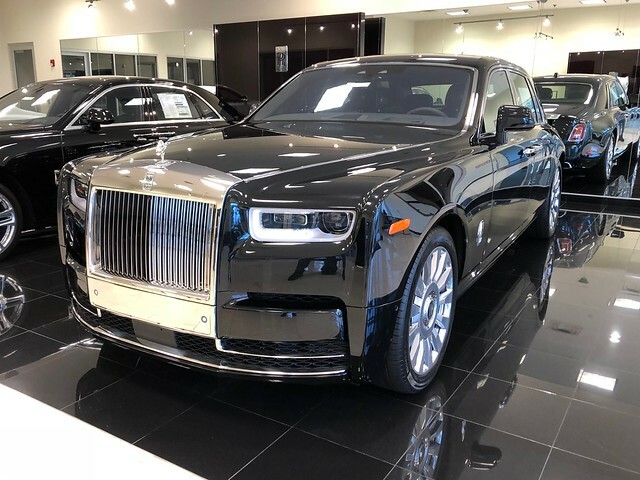 A quick visit to Steve Foley’s Cadillac-Bentley-Rolls-Royce dealership in Northbrook yielded my first in-person sighting of the majestic Phantom VIII. Then, I made a mistake. I drove into Chicago. Not that it was a bad thing, but I was hoping to avoid it. 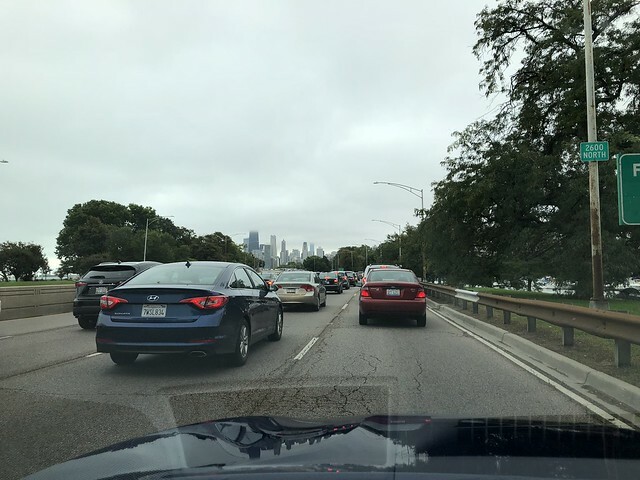 Luckily, most of the traffic was easy to manage, except for a half-mile of Lake Shore Drive, in which I exited before it got really heinous. I was hoping to make a couple of stops while in the city, but I had an appointment to make. Around lunchtime, I went over to Des Plaines to meet with a colleague and friend at his new job. Jo Borras wrote for Gas2 and another performance site a while back, along with forming his own Volvo blog recently. He just became the sales manager of a Honda motorcycle store. Since I will be working on a motorcycle article for another outlet, it was a chance to not only catch with Jo but to pick his brain on product items. Our conversation went to other topics – related, of course. It was great to reconnect with Jo while I was in the area. Let me skip the activities of Wednesday, as I already covered them in my last article. My final night in the Chicago area was spent with a visit from my old publisher and friend Tom Wray. He drove out to meet me at the hotel and we returned to the nearby Fox & Hound sports bar across Roselle Road. Tom and I chatted about the state of his outlets and how he found that be being statewide in his coverage, he found his audience. Not to mention the state of our shared communities, which are not in good shape. Sometimes, we can emerge from our past to seek new plateaus and live our lives, fulfill our work and move forward. It appears that we both have – given our shared history dating back 20 years or so. 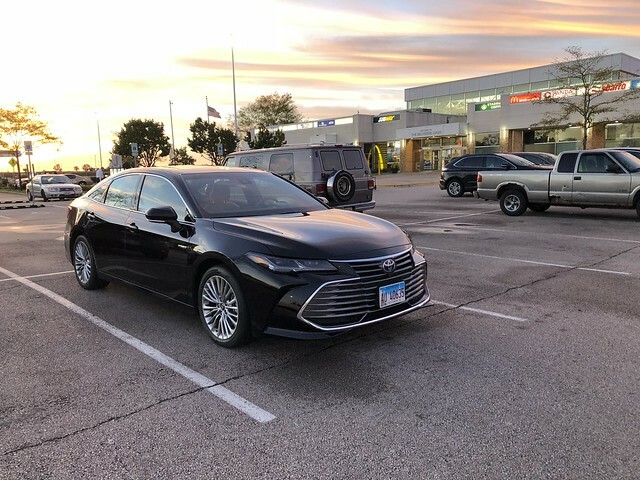 I checked out early on Thursday as I have the drive home ahead in a new vehicle I took home to work with – a 2019 Toyota Avalon Hybrid Limited. A stop for breakfast at the Belvidere Oasis came with a decision to make. Should I go back the way I came through Wisconsin or go a different route I have never taken before? As the sun appeared over Lake Michigan, the decision was made. Skip Wisconsin and head west towards Dubuque, Iowa. It was a rewarding decision. Once you get west of Rockford on US-20, it turns into one of the most beautiful stretches of road one has to experience. It gets even better when the highways switches from a four-lane, divided one to a two-lane country road full of elevations and turns. The reward is Galena. It is perhaps the most beautiful town I have ever seen. While it was the home of President Ulysses S. Grant, this historic place along the Galena River remains intact from its glory days prior to the Civil War. I wished I would have stopped to take photos of this place, but my goal was just 15 or so miles ahead. Dubuque was my welcome spot for Iowa. It has been years since I last visited and always enjoyed its bluff-side downtown overlooking the mighty Mississippi River. 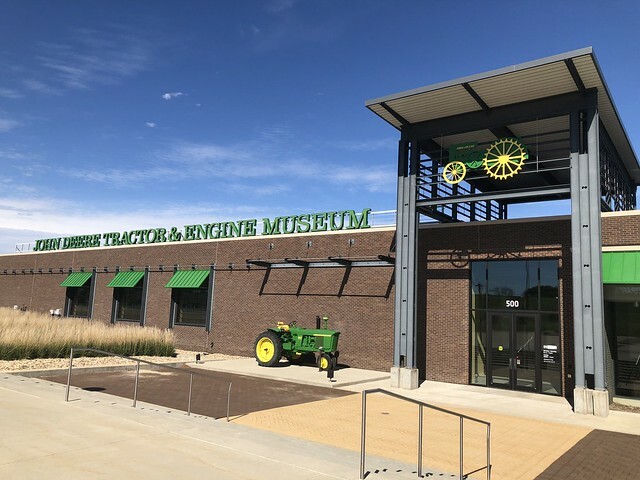 A stop at their visitor’s center revealed a change in plans. I was going to take US-52 north towards Decorah and Rochester before hitting home. Unfortunately, some recent storms caused flooding on the highway between Dubuque and Decorah causing US-52 to be shut down. The rest was just an easy highway run through Mason City onto the Interstate back home. The skies changed from blue to gray. The temperatures had been dropping into the 40s once I left the hotel but never deviated once I got back into Minnesota. Fall had already snapped, despite the temperatures in the 80s with some nasty winds hitting the Autobahn Country Cub the day before. The theme of this past week was centered on being “out of the office” to accomplish work towards events and other possible content. 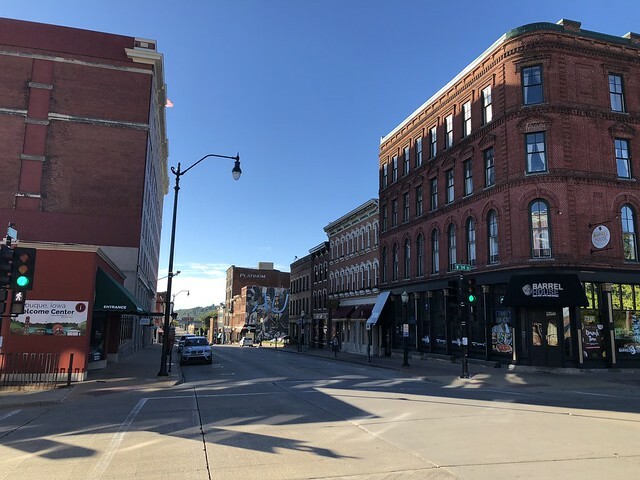 The drive to/from the MAMA Fall Rally enabled me to not just be “out of the office,” but to gather experiences that had been on hold for far too long. It was also to reconnect with friends and find new ideas to take home. Was it a “working vacation?” You may call it that. I call it gaining more experience from witnessing things that will last the rest of my lifetime.